Trishula, Dragon of the Ice Barrier is our #1, and there shouldn’t be much surprise about that. A monster taking 3 monsters at the very least to be Synchro Summoned is more than previous entries, but the banishing of up to 3 resources of your opponent even out the materials used. Field, hand, and grave removal ensures you take away a resource from each area where a strategy can rely on. If done first turn (you going first) you’ll only remove one, but you’ll get an instant look at what your opponent is playing. Trishula is the best Synchro to use, regardless of archetype or strategy you are playing. If you have a Tuner, you are packing a Trishula in the Extra Deck. There are times the effect can backfire, but that only occurs when the banished cards gain effect(s) off being banished (Giant Rex), and those instances are small at best. 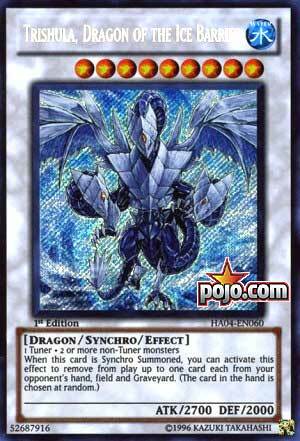 Trishula is the best Synchro in almost any situation because of its removal. Even if you only remove one card, you still are left with a 2700 beatstick. The only thing different from the last review of Trishula is that it’s Friday instead of Throwback Thursday. Happy Friday! and enjoy the number 1 Synchro Monster of all time and all future time probably. The effect is almost always live and the 2700 Atk beater is just high enough to be awesome. This will always be limited. This will always look great. Trishula will always have exactly one downside, being that she needs 3 monsters to Synchro Summon. Worth it. The best Synchro of all time is one we looked at a few weeks ago, but we will look at it again for the sake of this countdown, though this time I’ll be a bit quicker with this review. Originally released in Hidden Arsenal 4: Trishula’s Triumph, we have the namesake of that set: Trishula, Dragon of the Ice Barrier. Trishula is a Level 9 WATER Dragon Synchro with 2700 ATK and 2000 DEF requiring one Tuner and two or more non-Tuners. The two non-Tuners make it harder than most other generic Synchros, but it isn’t impossible. It is currently limited so these can’t be spammed out too much, and trust me, this being spammed too much is a bad thing because it can banish up to one card each from the opponent’s hand, field, and GY. This thing will eat away at your opponent’s advantage and had to be limited quickly upon release so you couldn’t spam three of these out without De-Synchro. In the OCG, Infernity made great use of triple Trishula when they could, and that just sounds terrifying knowing how good Infernity is at full power, even though OCG didn’t have Barrier. This was eventually banned in 2012 with Plant Synchro summoning this with great ease though banning Trish might of been overkill with Spore and Glow-Up Bulb being banned and Reborn Tengu going to 2. I made this more of a history lesson because we did review Trish a few weeks ago as I mentioned, so you don’t have to go far and find that if you wish. Trish hasn’t changed much in two weeks. It was 5/5 on release, so the score didn’t go down over time too much. Art: 5/5 Ok, this is the best three headed Dragon, though I’d still give Blue-Eyes Ultimate a 5/5 as well depending on which of the two artworks it is. So, as you may or may not recall, we did just recently look at Trisula as Throwback Thursday, by my choosing, which I naturally wouldn’t have done, had I known we were doing this list. Alas, I have very little of difference to say now that I said then. Trishula always scores well (which proves just how potent and powerful a Synchro Monster can be) even in both Formats. She’s just THAT good, as if you didn’t already know. And, they are from all areas, as they have a card from the Hand, Graveyard, and Field, all removed from play. That’s a big -3 for them, while you just threw out a Monster with 2700 attack points. That could, and has, meant game, from this card, on more than one occasion. The Extra Deck is more crowded than ever, and there ARE more ways to return removed cards than ever as well. But Trishula can still win you some games, and if you have her and can fit her in the Extra Deck, I say you should.